We needed a place to break up the very long journey between Lima and Cusco (anywhere from 20 to 30 hours depending on which route you take). Our stop options on the shortest route were either Nazca, home of the famous Nazca lines which can be seen from an airplane tour, or Ica, a town known for its Pisco production and a nearby lake (Huacachina) in the middle of giant sand dunes. As you've probably guessed by now, we went with the latter option, and booked a room at El Huacachinero, which turned out to be an awesome hotel with a lovely pool located at the foot of the huge dunes. We didn't want to drop a lot of cash on a flight over the Nazca lines, and we only had 24 hours to spend in either place anyway, so we went with the more relaxing option. 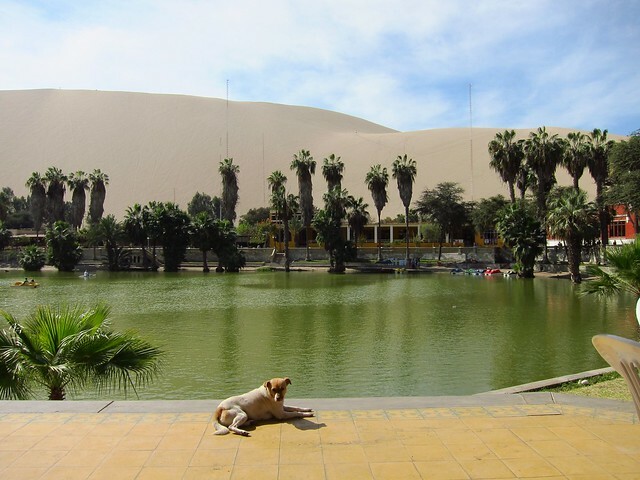 Huacachina is a random little town: it's basically just a small (polluted) lake surrounded by a few restaurants, hotels, and huge sand dunes. 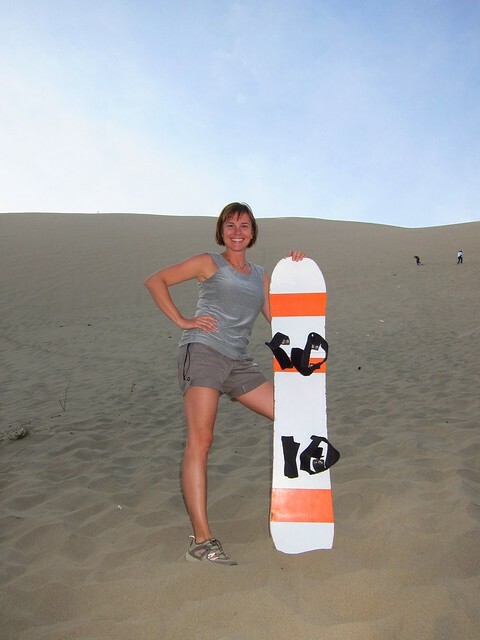 The main activities are roller-coaster-like dune buggy rides, sandboarding, and pisco-tasting at bodegas in nearby Ica. We had been on an amazing dune buggy tour when we were on the Oregon coast a few years ago, so we decided to spend our day visiting a pisco bodega (essentially a winery), tasting several kinds of piscos and wines, followed by sandboarding, which, for the record, was really lame. Despite this, we enjoyed our day in the sun and eagerly set off on our 17-hour bus ride from Ica to Cusco-- more on that soon! The secret is out. You are really still in DC and you are photo shopping your way around the world. The background in this picture looks fake. Damn girl, you look good!!!! All tan and it appears that you’ve grown in height as well…must be the Inca Cola. I miss you!!! haha, thanks! i’ve gained some weight since then… argentina is all steak, wine, croissants and gelato!